Michael Mahan at Worth Avenue Yachts tells me that the 30.78m motor yacht Moon River, a joint listing with Bradford Marine Yacht Sales is sold with Four Points Yacht acting for the buyer. Built by Palmer Johnson in 1997 to a design by Raymond Hunt, her deep-V hull form provides an easy, forgiving ride even in poor weather conditions and a $3.7 million refit in 2008/09 ensures that she’s in as-new condition. The refit saw Moon River receive new engines, new interiors, new electronics, new ship’s systems and top to bottom fresh paint. 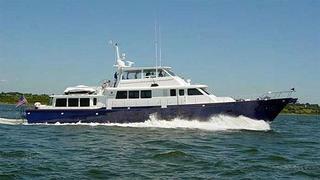 She can accommodate eight guests in four staterooms. Moon River was asking $1,999,000.